This post is in partnership with Christmas Tree Shops andThat!. All thoughts and opinions are our own. 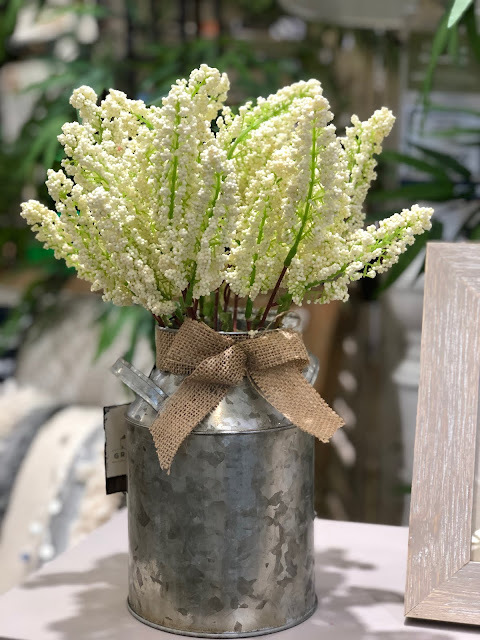 It's no secret that we love farmhouse-inspired decorating touches in our home. Give us all the distressed wood, pops of green, mix of metals and casual, relaxed style. 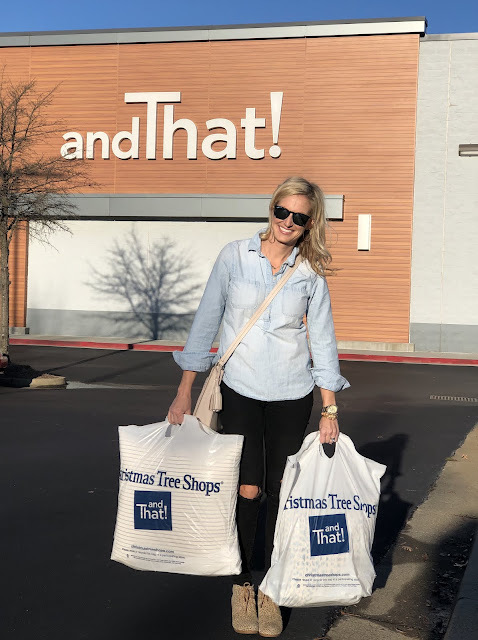 When we learned that one of our favorites, andThat!, was launching an exclusive farmhouse inspired line called The Grainhouse we couldn't wait to check it out. We walked in and fell in farmhouse love! 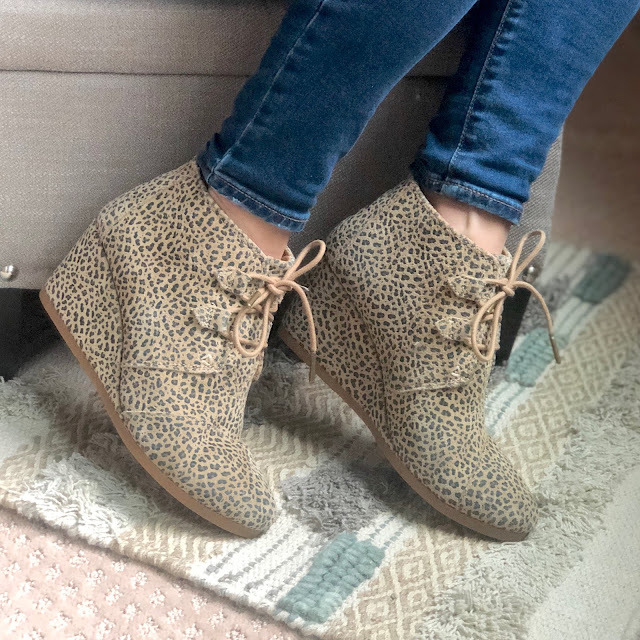 There were so many affordable and stylish pieces! 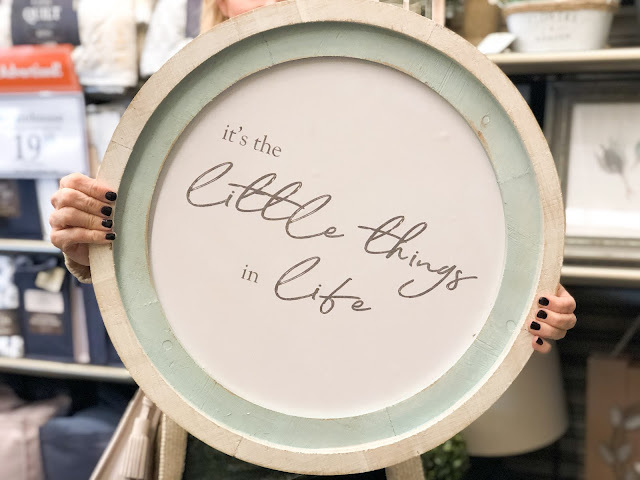 We both had a few home decorating projects in the works and we found so many great items to use in our spaces. We had the best time shopping in store! 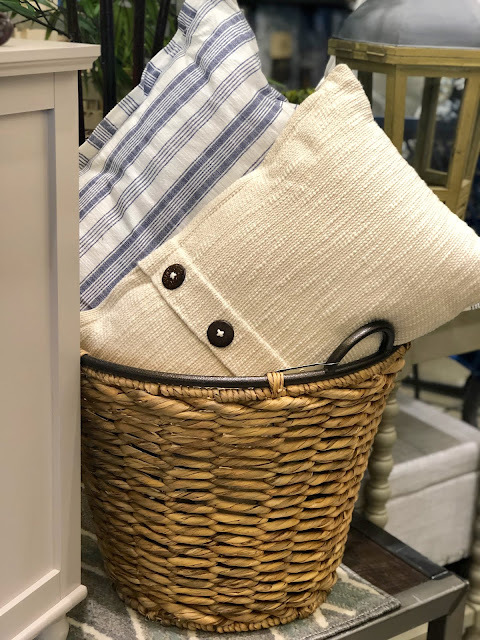 The Grainhouse collection has everything from furniture to textiles and all your entertaining essentials. 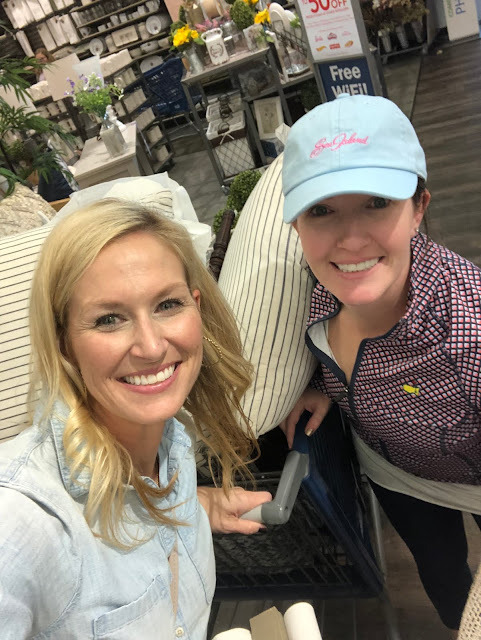 Seriously though, Jen and I started The Magnolia Mamas so that we could have a creative outlet and something that would help give us some of our identity back as we were both stay-at-home moms with very young children at the time. 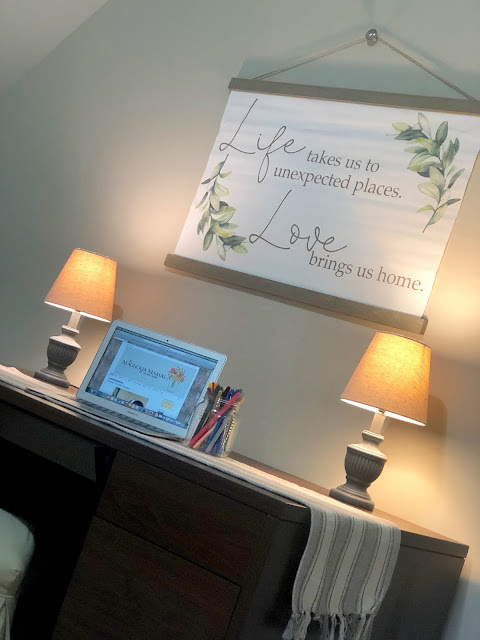 Because the blog has grown, I wanted a place that was just mine. Somewhere I could go to have some peace and quiet, somewhere I could go to focus and write when working on a blog post, and a fun spot for taking outfit pictures and displaying some items that are special to me. There are so many things I love about this room. Mostly though, I just love it because it feels so peaceful to me. I love using items in unexpected ways. I feel like that is part of what makes the farmhouse inspired decorating style so much fun. 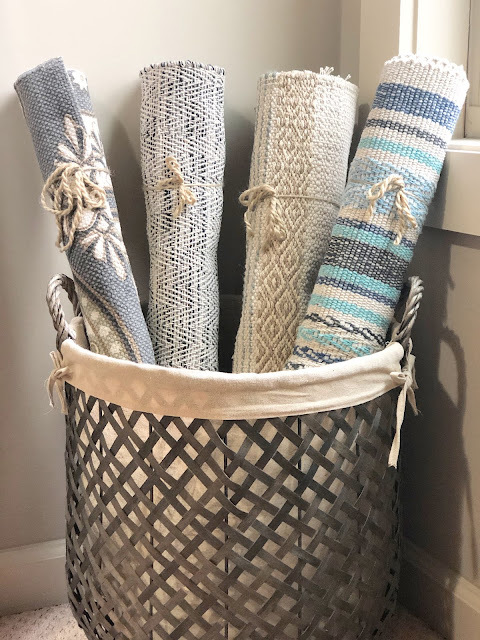 A basket full of rugs rolled up in not only going to be functional for me to have for different photoshoots, but it also fills that corner and softens the room. I fell in love with this gorgeous galvanized metal platter and couldn't believe the price! 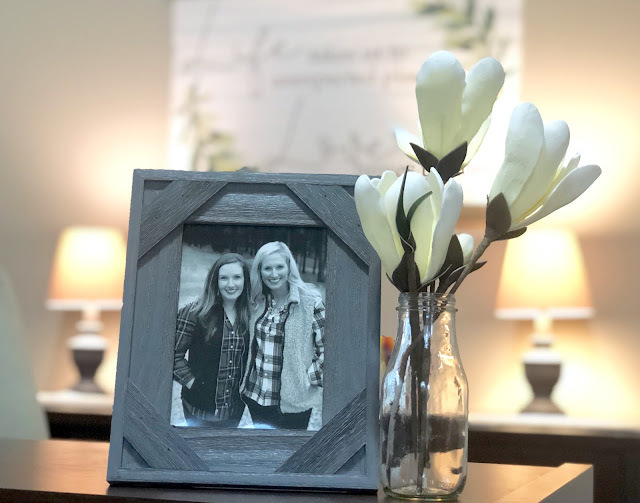 Obviously it would usually be used for entertaining in a kitchen I used it to add another mix of materials and it is serving as a catchall for jewelry and accessories. 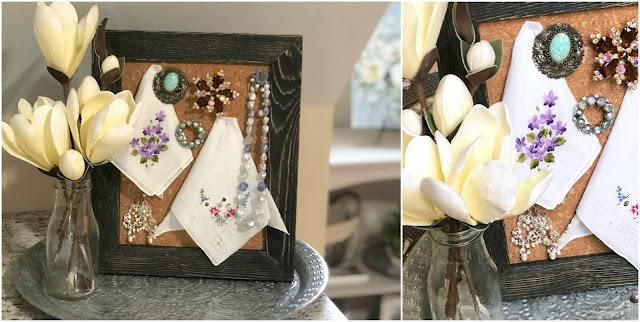 Also, this picture frame became a cork board when I added a cork sheet to it and it now displays some very special items! 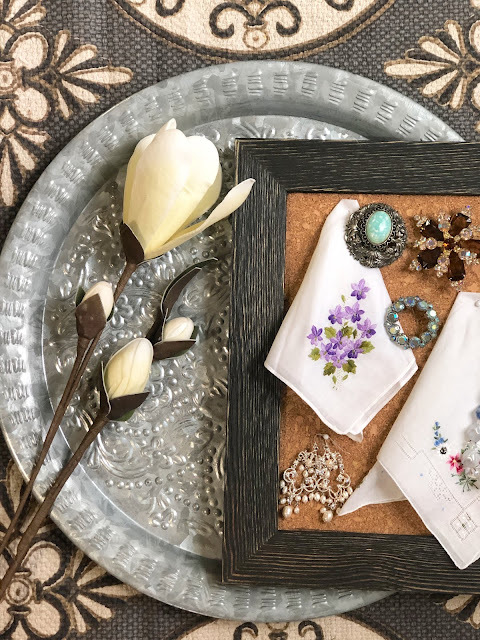 The handkerchiefs, broaches, and beaded necklace are accessories that belonged to my grandmothers and I also added my wedding day earrings. My grandmothers were the epitome of southern belle's and they were so very stylish. From fancy scarfs, fun jewelry and never leaving the house without lipstick, I feel like they definitely played a part in my own style. Because sharing style is so much of what we do now on the blog, I love that I can look at these pieces daily. I'm so excited about Carrie Beth's new space I can't stand it! It makes me want to tell my kids they now need to share a bedroom so I can claim a room and decorate it all Magnolia dreamlike on my own! 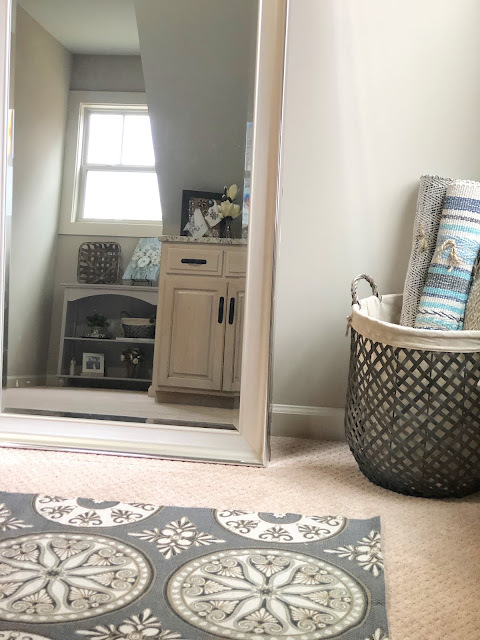 I love that from bookshelves to baskets (and everything in between) it was purchased from one store! Shopping at andThat! Is always so fun, but shopping together was such an experience. You should have seen us strolling through there with multiple carts filled with Grainhouse products. The checkout girl didn't know what to think. She laughingly said in passing, "Y'all purchased one of everything! You will have to take pictures of all this when its put together and send it to the store." Girlfriend had no idea of the snap-happy purchasers she was dealing with. 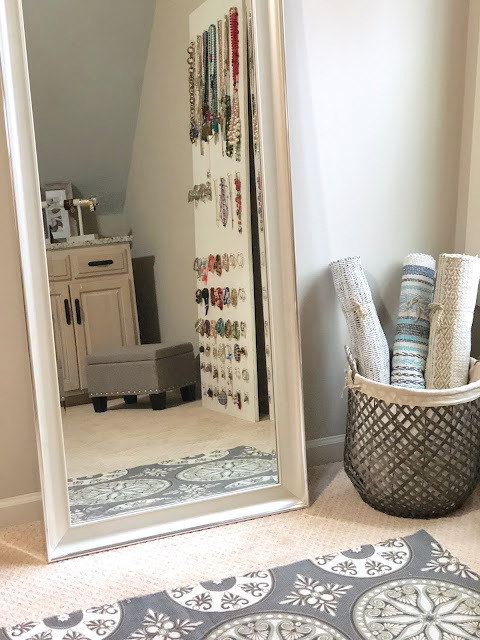 I was lucky to get a teeny tiny sneak peek of the Grainhouse line a few months ago when I was getting started on my bedroom makeover. 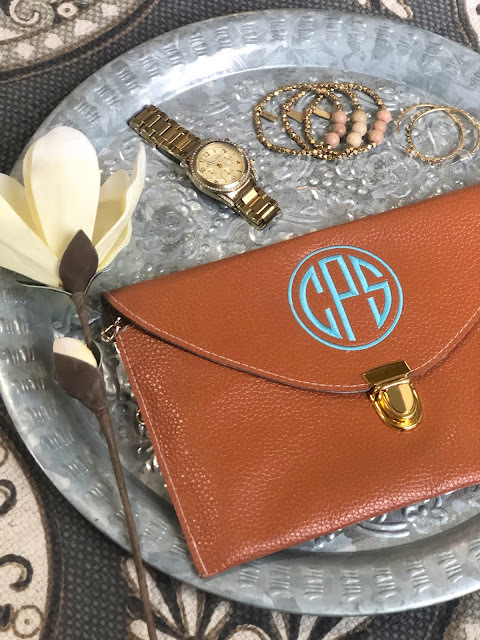 I'll discuss more of the details on that next week, but when I was shopping with Carrie Beth I couldn't help but grab a few more items to add. The Grainhouse bedding is swoon worthy and so inexpensive! I had purchased the striped bedding a few months ago, but the minute I spotted (or really felt) the white Washed Pintuck Comforter Set I knew I had to have it. It feels like a cloud. And I don't know about you, but that's kind of what I'm going for when it comes to the whole sleep thing. One of my favorite parts about the Grainhouse line is all the throw pillows. As a not so recovering pillow addict, it was so hard to limit myself to just a "few". I wasn't about to leave the store without at least one ruffle pillow and one macrame pillow in my possession. Stumbling upon the railroad striped pillows were just an added bonus. And I didn't just stop at the bed. No my friends. I put those throw pillow everywhere I could. They just add the finishing touch to a room I think. You can never have enough. Cozy soft throw blankets come in a close second. I limited myself to just one. A girl has to show some restraint occasionally. I grabbed this cute round accent table and a few picture frames, topiaries and other little accessories to complete the space. 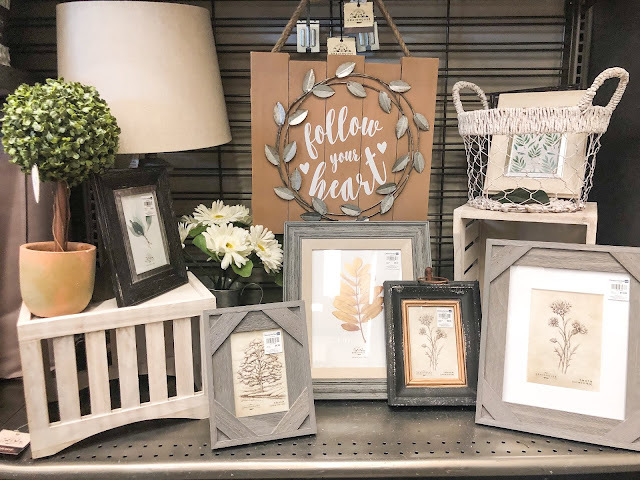 I have a few more home projects on the horizon and already have a few more fun pieces from the Grainhouse line earmarked for purchase. 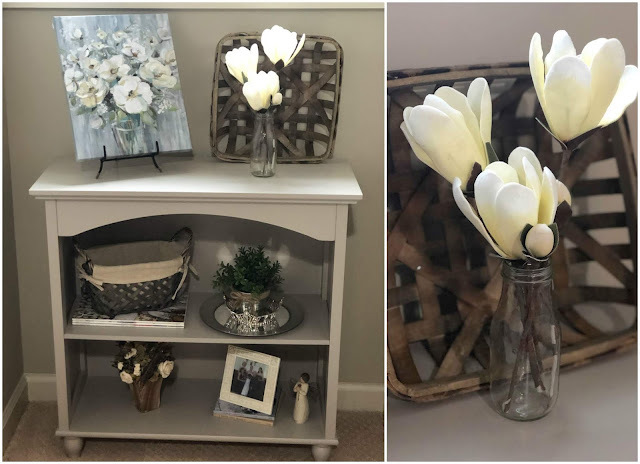 Do you love farmhouse style decor? 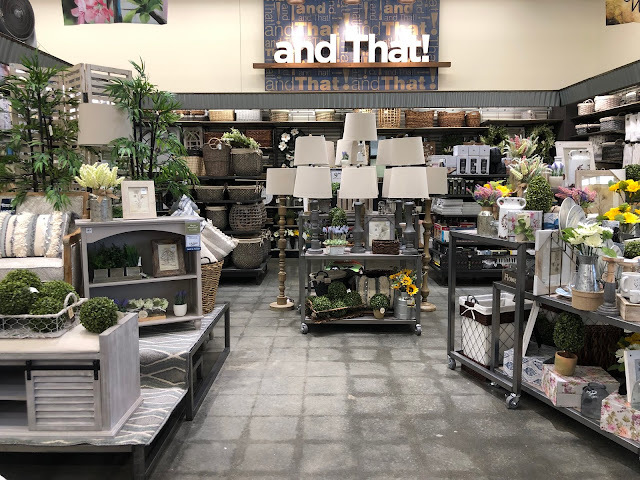 Learn more about the Grainhouse line from andThat and check out some of their other amazing decor pieces HERE.